With Brexit less than eight weeks away, it's becoming clear that the British economy is stalling as firms struggle with the uncertainty over what will happen. Hot on the heels of the news that carmaker Nissan is scrapping plans to build a new SUV in its plant in northeast England, a survey on Tuesday showed that the British economy as a whole is almost flat lining. Financial information firm IHS Markit said Tuesday its "all-sector" purchasing managers' index, which incorporates gauges of manufacturing, construction and services activity, dipped to 50.3 points in January from 51.5 the previous month. Were it to fall below 50, it would be indicating a fall in output. "The survey results indicate that companies have become increasingly risk averse and eager to reduce overheads in the face of weakened customer demand and rising political uncertainty," said Chris Williamson, chief business economist at IHS Markit. Though the survey takes a snapshot of only one month, it provides a steer as to the economy's momentum. The Bank of England, for example, watches the survey as it assesses it monetary policies. The Bank of England is due to keep its main interest rate on hold at 0.75 percent on Thursday. There will be particular interest in its updated economic forecasts in light of the Brexit impasse. 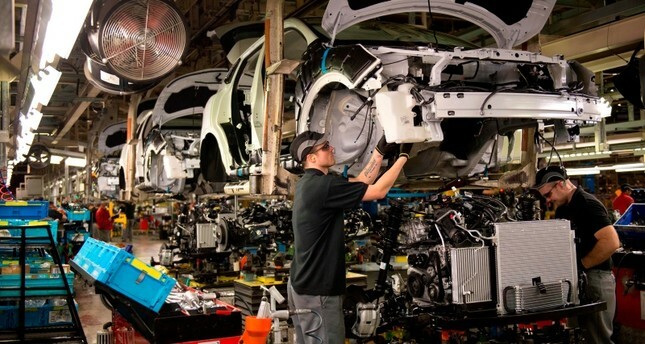 Surveys from the likes of IHS Markit, but also from the Society of Motor Manufacturers and Traders, are all pointing in the same downward direction amid the Brexit impasse. Britain is due to leave the European Union on March 29 but it's still completely unclear how it will do so after Prime Minister Theresa May's Brexit withdrawal deal with the bloc was overwhelmingly defeated by lawmakers last month. A scramble to come up with an alternative plan has yet to yield any results and there are mounting fears that Britain could end up crashing out of the bloc with no deal on future relations. That would likely mean new tariffs on British exports and serious disruption to trade between the two sides. Given that backdrop, firms don't know how to plan, whether to invest in new plants and machinery or not, or whether to recruit staff. According to the survey, firms in the services sector, the bedrock of the British economy, are particularly uneasy. New orders are at their lowest level since July 2016, the month after Britain voted to leave the EU in a referendum. "With no deal in sight, business and consumer caution will only intensify, risking a first quarter contraction," said James Knightley, chief international economist at ING.